This is probably the coolest batrep this year. You know why? It's at home, in my Warmachine room. Well, Warmachine room for now. My office is off to the side, completely untouched remodeling wise. That's where everything will actually go. For now though, what used to be an apartment upstairs is now essentially a giant mancave for warmachine. That's what happens when you get 2200 sq ft in a house and you have no kids. So yeah, there's a painting desk in there, a recently built cardboard airbrush booth (I'm beginning to worry about developing acrylic lung cancer), another work table, and my folding Warmachine table in the middle. On sawhorses. Super developed. And crappy lightbulbs. But it's home, and it's awesome. Nevermind the shag carpet from before the Vietnam war. Heck, the house was built when Germany was ruled by a Kaiser. The shag carpet's an upgrade. Anyways. I smashed a guy's Kaya1 list with Grissel2. I felt slightly bad about it, but I also hadn't played Grissel2 before, and I wasn't running the typical MMM list. I realized a few weeks ago that I was two casters short of the full Troll compliment (in comparison with my first faction Cygnar, where I still only own less than half of them. 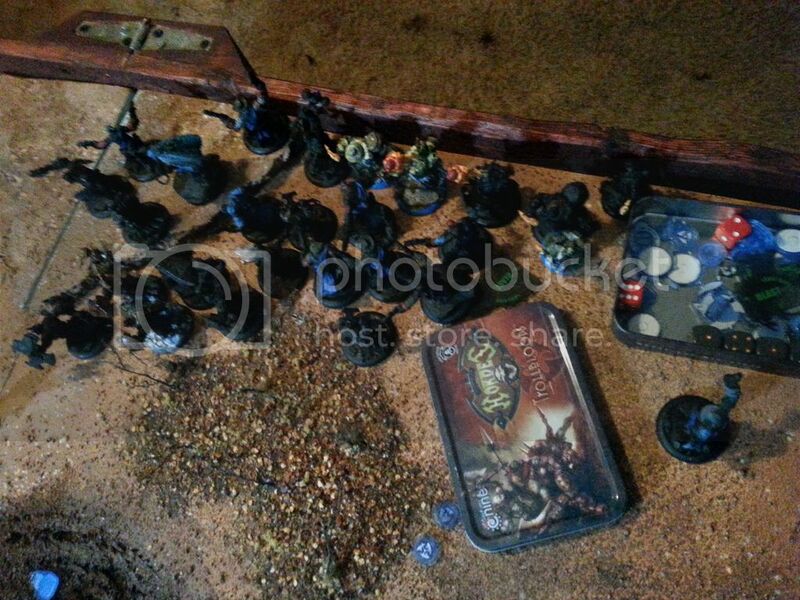 Maybe a third), and so 50$ later for two models (slight exaggeration) I got Gunnbjorn and then Grissel2. The main reason I got Grissel2 is because someone on the facebook group pointed out that Dash ignores freestrikes. That's pretty slick. It'd be sweet if we had something in this faction that had opportunist. Victor Pendrake could possibly go away in favor of a Runebearer. I haven't decided yet. Between Opportunist and the Fell Caller, I have a lot of ways to hit/shoot pretty accurately. Other than that, I really like the list, even though I didn't once get Opportunist off. Turns out Kaya1 yoyoing everything around is hard to get behind. On the other hand, I won pretty handily at scenario, even with his Gnarlhorn bulldozing through my models every turn and throwing another troll at Grissel. He ran Kaya1 with Gnarlhorn, a Feral and Megs. Then full Reeves w/ UA and full Wolves of Orberos with UA as well. Plus other stuff. Most of it really struggled against the ARM I was bringing, and he never flanked hard enough with his Reeves to really bug Grissel. So we spent the next week Dojoing it, and my wife fielded the test. The idea was that a Pureblood could be juggled, spraying 10'' every turn, and be pretty effective, especially with a Moonhound in the turn. Anchor it with Ghetorix and a Gorax, hold a cloud line with druids and slow me down with Skinwalkers, and it should be a game. Mine was the same as it was previously. Identical. We rolled off, I won, Jessica stuck to her side, citing that she could used the ruined building to stage out of. Scenario was incursion because I don't have square zones yet, and they wouldn't fit on this map well anyways if I did. My stuff runs. Grissel2 casts Dash, dumps everything else to the stone and charges. 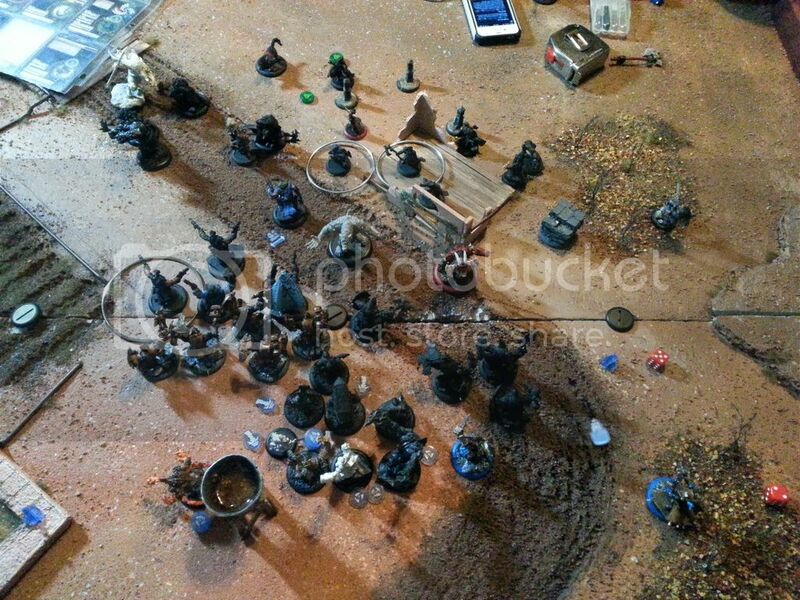 Highwaymen get Tales of Mist (Concealment, and since they have camoulfage, DEF16) and run a whopping 14''. I brick up a little in front of her with them, and everything else just tries to keep up. Pyre on the left puts fire on the eaters there, lights them up. The KSB pops aura and shuffles, and the right Pyre lights the other unit on fire. I've rolled 11s before and killed my dudes, so my left unit made it out, but with the KSB aura up, it's impossible to kill the one directly hit, so that worked out, The Grissel moves up about two inches. I've boxed her in with the HWM, but I'm not too worried. My line of battle is already pretty far ahead. 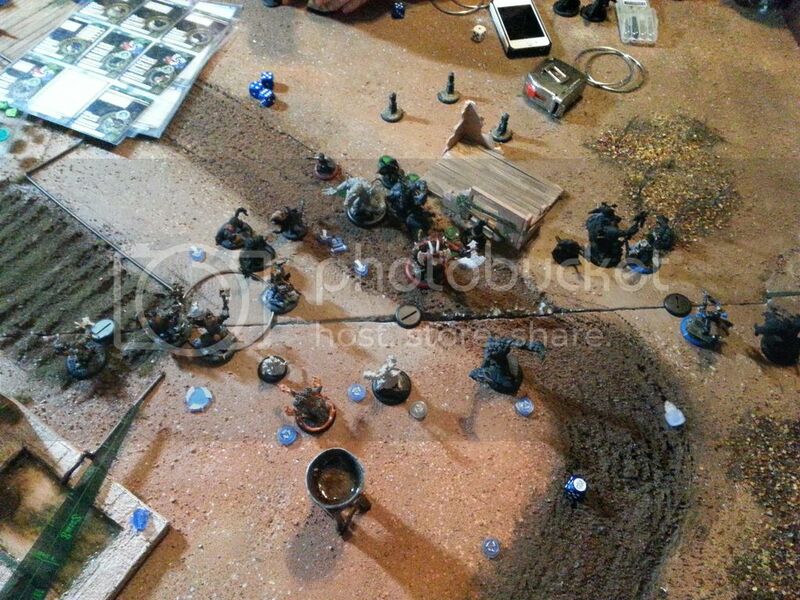 She casts Dash, and feats and launches an AOE at the skinwalkers which drifts back and remains in play. The left Fire Eaters go and kill two Skinwalkers easily. I was pretty nearly three. If I'd had another inch, I'd of cut the unit down pretty bad with them. That was just sprays. The right Fire Eaters go, and one goes into Maximus. I wanted the other to hit the groves, but I didn't have LOS. So one went into a Druid, and the leader maintained CMD with them both. Because the Druids ignore fire right now, I do nothing to them, and I'm out of range of the stone, and the little guy fails to kill Maximus. Meh. The Highwaymen move up, and I can't get within stealth with most of them against the Skinwalkers, so one or two put shots in, but it's not very crazy. The Warders run, staying under the KSB as much as possible. Victor shuffles in. Jess drops Occultation. The Blackclad moves up and sprays the Fire Eaters, killing 2, but not the little guy. The Druids activate, two cloud, and the others try to kill things. One tries to kill the Fire Eater but fails. Two other try to push a Highwayman out of the way of the Pureblood. The first hits, toughs him, moves him a little. The Second hits him, toughs him again, but pushes him far enough out of the way. The Pureblood walks forward and sprays into my army, hitting all of the KSB unit, but my tough rolls are crazy good and she only kills one of them. The Aura is still up, and she missed a few anyways. The Moonhound was too far back to get involved. The Gallows grove moves in and Ghetorix ports up and lays waste to a bunch of Highwaymen, and one Warder now not needing tough. Maximus moves into melee with the Fire Eater leader and kills both of the medium based guys. That looks like this. Then Kaya spirit doors both heavies back to her, behind the clouds and feats to handle the fury. 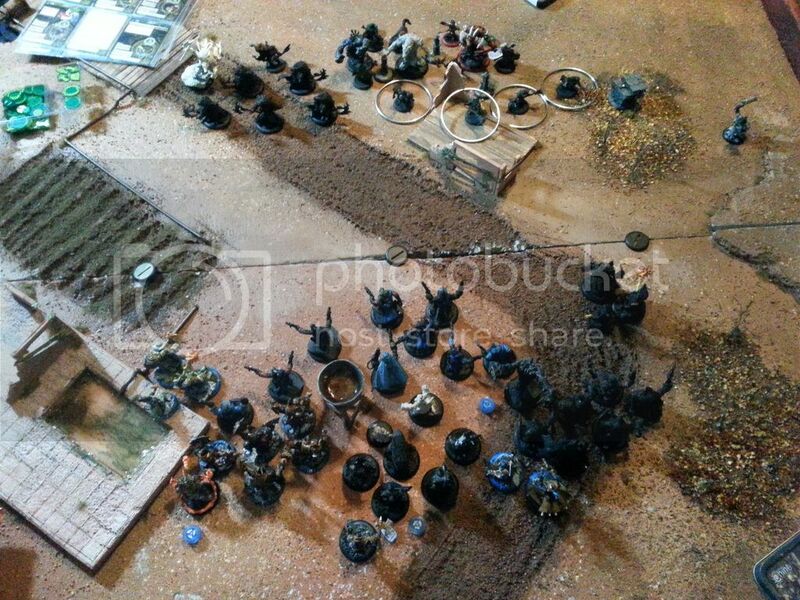 The Skin Walkers charge in , completely unbothered by Grissel's AOE, and start wiping out Highwaymen and trying to get Warders. 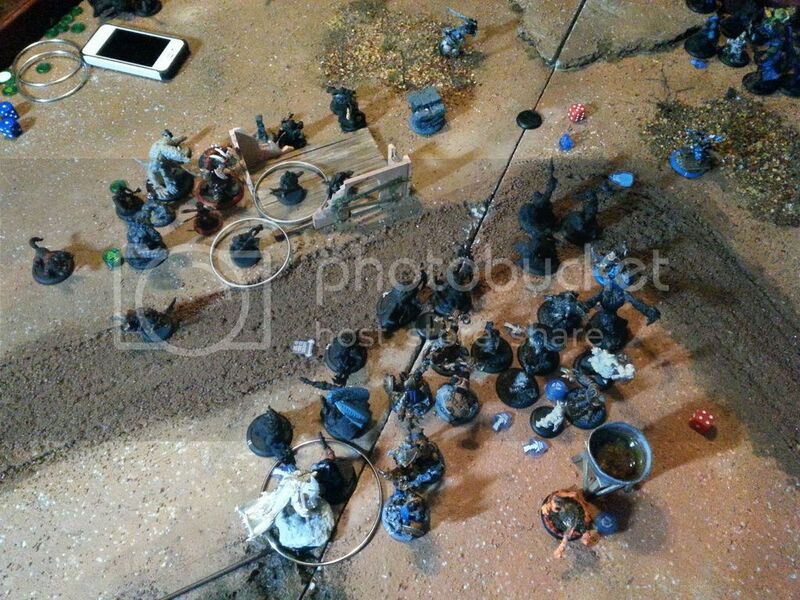 At ARM23 currently, they're only putting a box in here or there, but they force tough/kill a bunch of Highwaymen. Enough that I have to pass a CMD check, which I do. This is also my wife's first game with her own Circle tokens. She finally got tired of using Khador ones, and now has her own circle ones. AND she downloaded War Room to her phone. This girl's friggin perfect for me, guys. Also, I just realized I didn't move any Warders forward at all when the Skinwalkers damaged them. Anyways. The Fire Eater on the right dies. The Fire Eater on the left swings at a Skin Walker but doesn't do much. Fire went out on him I think. I really want to get into Kaya's line, but I have four Skinwalkers in my face and no chargelanes. Braylen starts the day off and shoots Maximus dead. You go girl. She guns and runs b2b with the flag. Looking at the pics now, this was a pretty solid chance to use Dash and Opportunist on the few Highwaymen I had left, but I failed to do so. I don't even know that I cast Dash this turn. The Warders on the right go. One goes into the Gallows grove and somehow fails to kill it at PS12 4d6. Another engages a Druid over the wall and misses. The other two just push foward. The KSB moves up and pops Aura. Grissel refills it as much as she can. I consider inhospitable ground, but at this point, stuff is teleporting and it won't do me much good. 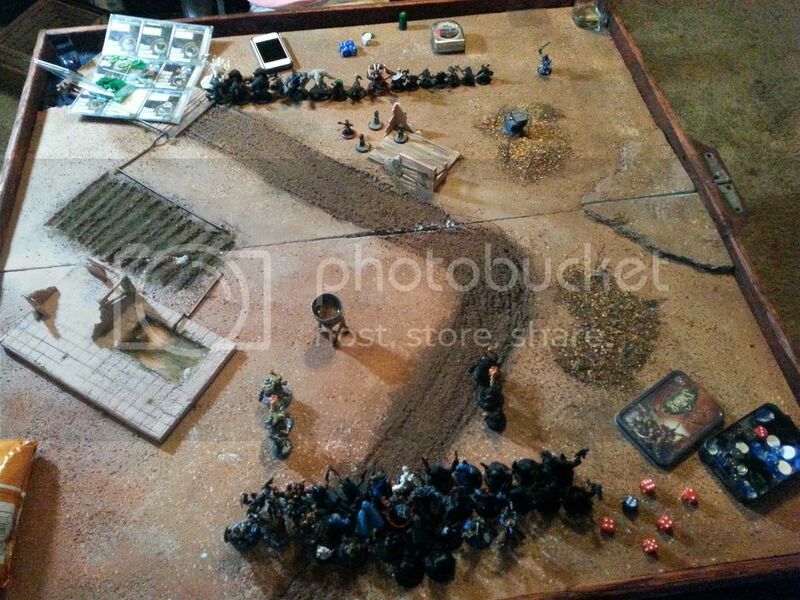 Inhospitable ground would have been better the turn before when the Skinwalkers charged. Nope, they have pathfinder. Nevermind. 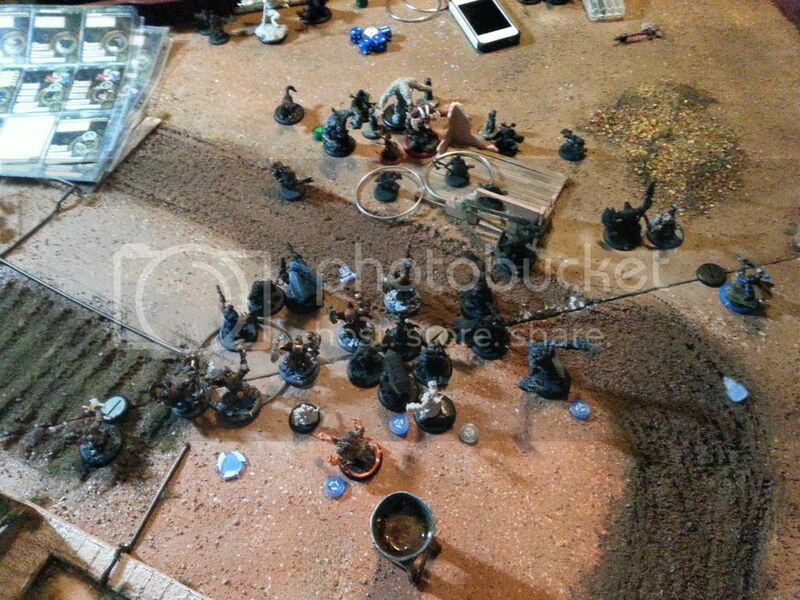 Warders on the left go, and they end the skinwalkers pretty easy except one the HWM are engaged with. I'm pretty sure I forgot about the best part of Dash at this point. Chronicler runs to left flag and controls it. I'm at 2 CP now between Braylen, the Chronicler. Looking at the pic, I see 3 CP, because I don't know what was contesting the center flag. Must have been something. Anyways. Jessica's in a pinch, and she's a little frustrated with this list. We don't normally play competitively against eachother, and right now she feels like a guinea pig. So the Skinwalker that's left kills both Highwaymen. 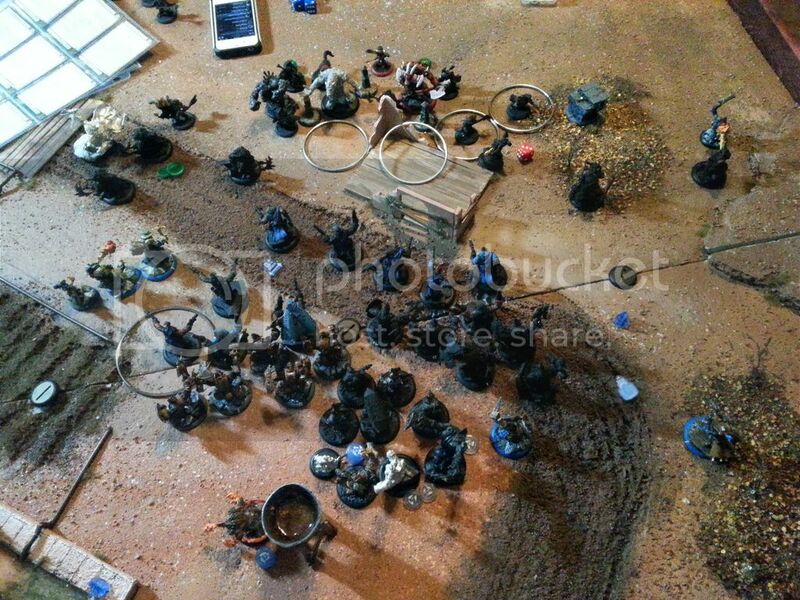 Jess wants to get the Pureblood forward and kill the KSB, but decides to soften them up with the Blackclad first. He moves up, sprays in. Hits a Warder for a few points, hits Grissel for a couple, and completely wipes out the KSB. Every one of them die, including the UA, and all fail their tough. So the Moonhound runs around to the Warders, charging one and failing. The Druids move out of the way of things and three of them get into the one Warder and Fell Caller on the right, failing to kill them, but contesting the flag. Two of them shoot a Warder and pull it towards them. The Pureblood walks up and sprays the left Warders, leaving them on one or two boxes each, killing one. Then Ghetorix ports. He lands on my side of the building. Gorax primals him, and then things go down. He warps for strength first off, and he's MAT9 PS21 atm. My KSB is gone. The first Warder he hits he oneshots at Dice +2. I tough, so she moves on. She kills four more warders, including the one the Druids pulled closer early (all part of the plan apparently), and then buys a last attack to finish the toughed one. She doesn't spirit door any of them back, daring me to try to take the central flag back. Kaya Occultates herself and moves in behind the Gorax and Pureblood. My wife's first experience with a Double Warder list. Seems like she's doing ok. The problem is that she failed to contest my left flag, and I score another CP, taking me to 3. If I end my turn right now I get four. I could try to kill Ghetorix and clear the center flag, and I may or may not have enough to do that atm (My warders went from 9 to 2 or 3), but it's way easier for the Fell Caller and Warder to clear the far right flag. So I go for that. The Fell Caller gives himself and the one warder left from that unit Warcry, and the Fell Caller kills 2 druids by himself. The Warder kills the last, and that's game at 5CP. 1. My wife was pretty sure by turn 2 she was going to lose. She didn't feel like she had a way to handle ARM23, and she was pretty much right. Not without comitting and losing Ghetorix. She made the best of it though. By turn 3, she saw the light and made a major push and she nearly got me. Her major mistake was not running the Argus right at the flag and contesting the Chronicler. That would have made my following turn far more difficult. Probably still could have done it, but it would have forced me to do more work. Otherwise, I thought she did pretty well. She's never seen Grissel2 before, it's not like she listens to podcasts, and she handled it pretty well. 2. The list needs work. The Skinwalkers really went in because we wanted a unit that could use stealth, and she hadn't played them yet and really wanted to. In the future, she'll probably almost always use Bloodtrackers. They'll tarpit far better, and Occultation can go on Ghetorix. 3. The Argus Moonhound / Pureblood strategy wasn't that great. You only get one shot with the Argus, and then he will die. It's a four or five point commitment per 10'' Spray. Probably not worth it. Nice, but probably not worth it. The Pureblood is better off just porting in and aiming. 4. The future list will probably be Ghetorix and a Stalker, and maybe the Pureblood still. Otherwise it'll be double Stalker. Gorax for sure will stay. Double Groves would be nice, but yeah. Anyways. Hope you enjoyed the batrep. Check me out at Diceotfirstdegree.blogspot.com or follow it on twitter, @diceotfirstdegree. Cya around!